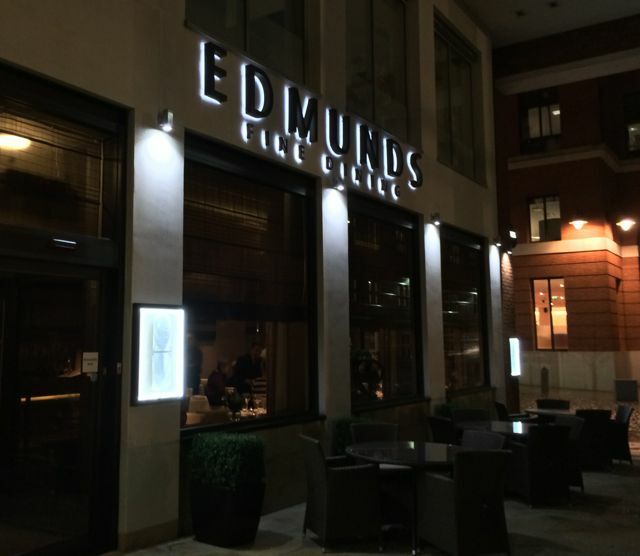 One of our very first reviews was of Edmunds Restaurant on Brindley Place, after we’d enjoyed a lovely New Year’s Eve dinner there while it was under the patronage of Chef Andy Waters. Since then Andy has moved on to other things (see review for Waters on the Square) and French Chef Didier Philipot has taken up the knives in this fine dining restaurant. The interior has had some subtle changes, it now for instance has brighter lighting, but the feeling is still luxe and comfortable with white linen, fine glassware, and elegant silver butter cloches. There are a number of ways to dine here, you don’t have to take an enforced taster menu as is the case with quite a few of Birmingham’s nicer restaurants. There’s a Carte d’Hôte (£24.50 for two courses, £29.50 for three) available most of the time except after 6pm on Friday and Saturday, a nine course taster menu at £75 plus £55 if you want the wine flight (a glass of wine chosen to pair with each course), and an à la carte menu (£40 for two courses, £45 for three). The wine list is fairly extensive with wines ranging from £30 to upwards of £150, we settled on a £40 bottle of Coopers Creek Marlborough Pinot Noir after a G&T aperitif. 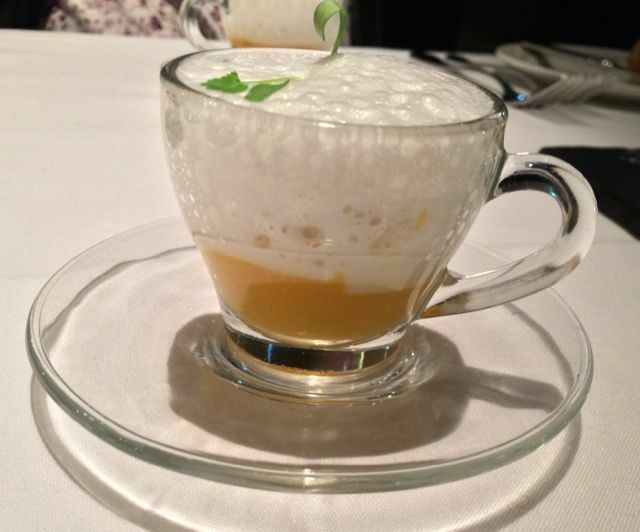 We ate from the à la carte menu, but before our starters arrived we were given an amuse bouche of silky butternut squash and ginger puree with a toasted sesame foam. I never know how to feel about foam. The puree was rich and creamy with just a hint of the ginger zing. 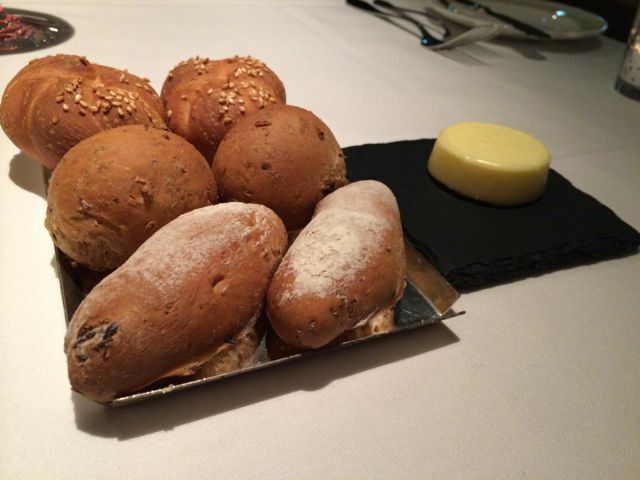 We also had breads, including a wholegrain bread with bacon flavour, which I want to have every morning from now on as toast. I opted for the Lobster & Crab starter, a golden orb of Devon lobster and crab risotto arancini accompanied by mushrooms and a lobster bisque. Being in one of the UK’s most landlocked cities I don’t eat a lot of seafood but I do love it. The bisque wasn’t overly heavy, sometimes I find it overpowering, and the flavour of the lobster and crab was fresh. I like the texture difference between the crisp coating of the arancini against the gooey unctuous inside. 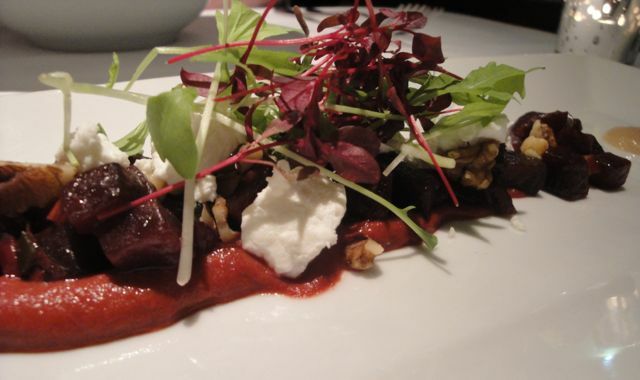 Our other starter was a warm beetroot and goats cheese salad from the vegetarian menu. The beetroot was served two ways, a sweet beetroot mousseline was topped with beetroot cubes and goats cheese, with tart pear puree on the side to compliment. For more textural contrast walnut and pine kernels were used. I’ve not seen the term “mousseline” before so I’ll assume you haven’t either, although I can’t find a definitive definition I think it means a sauce that’s been passed through a very fine sieve. I always like the way beetroot dishes are so striking because of their colour and this dish delivered on that front as well as taste. 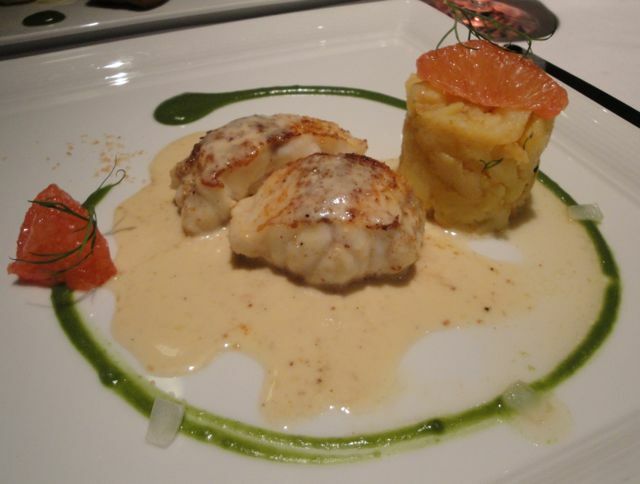 For mains, I stuck with the seafood, medallions of Cornish monk fish with a pillar of buttery potatoes, grapefruit, a coconut sauce with toasted dessicated coconut pieces and a watercress and pea puree. Coconut, grapefruit, and Monkfish – who knew that was a thing? It was though, the combination was both different and excellent, I may steel it for a dinner party. My only criticism of this dish was that I would have liked another chunk of Monkfish, but that might have been greed because I certainly wasn’t hungry by the end of the meal. 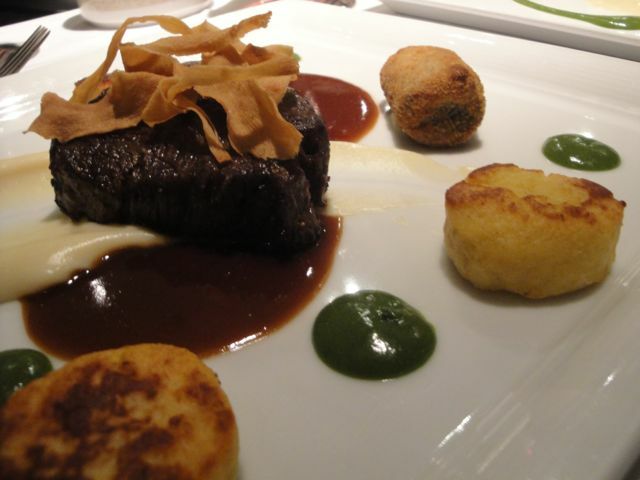 Our other main was a fillet of black Welsh beef, served with a beef Bourguignon croquette, potato gnocchi, parsnip, parsley cream, and port jus. The beef was good, and the port jus rich, contrasting with the welcome simplicity of the gnocchi and parsnip. The beef croquette was delightful reminding me of a grown up version of a meat Dutch croquette, although I didn’t get the promised boeuf Bourguignon flavours. As an extra course we were given a pre-dessert. A small square of mango cheesecake (it probably wasn’t a cheesecake but I can’t think of a proper word to describe it) with a perfectly ripe raspberry – I’m always impressed with a good restaurant’s ability to pick produce that looks and tastes spot on. I usually refrain from dessert favouring cheese, but there was a chocolate dish on the menu with cherries, and I really liked the sound of it. I was not disappointed. A scoop of pistachio ice cream was served on the side of a wide but shallow dish of what looked like cherry dotted sponge. When the sponge was cracked it revealed a lava flow of chocolate heaven. 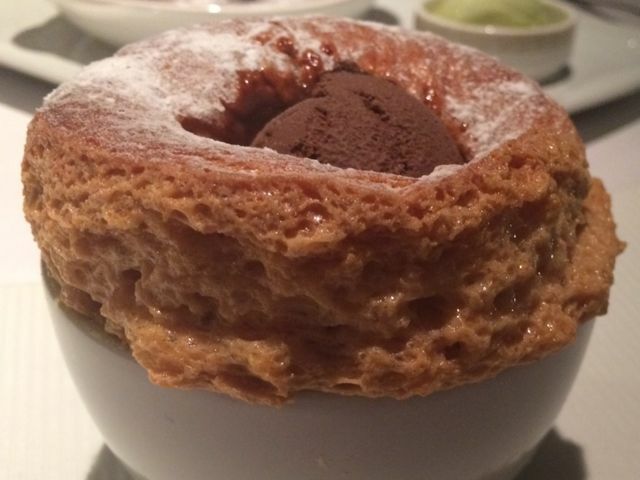 The theatre piece of dessert though was the hot toffee soufflé, puffed up a good inch or so above its bowl. Presented at the table whole the waiter cut a slit in the top and placed a scoop of bitter chocolate ice cream on it which slowly sank in to the soufflé and melted. Novel and very very tasty. Service was pretty much impeccable throughout despite it being an almost full house. Our bill was around £150 – 3 courses for two people plus a bottle of wine and G&Ts. Although that’s not a cheap night out, I genuinely think it’s good value for the quality of food and service that you get. Although it’s badged as a “French fine dining restaurant” the food style is more modern mixed in my opinion. I don’t think there’s anyone who couldn’t find a lovely menu for themselves here, take your parents, take your partner, go for a business lunch, and you’re sure to enjoy. 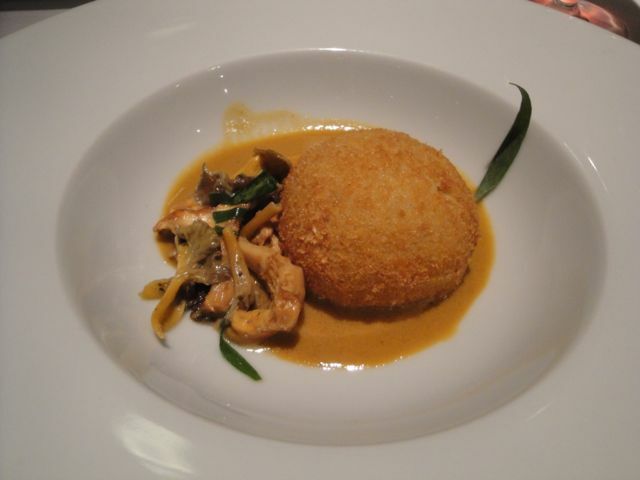 This entry was posted in Area: Brindley Place, Cuisine: English, Cuisine: Fine Dining, Cuisine: French, Cuisine: Modern Mixed, Price: Get your dad to pay - above average, Price: My eyes are watering - expensive, Venue type: Restaurant and tagged Birmingham Restaurant, birmingham restaurant review, birmingham review, Out In Birmingham, out in brum, OutInBrum, restaurant review, where to eat in birmingham, Where To Go In Birmingham, where to go out in birmingham. Bookmark the permalink.